Adding a traditional or contemporary conservatory to your home will increase your living space at a fraction of the cost of brick built extension. The Ultraframe Livin Room orangery is the ultimate cross-over product providing a cost-effective modern home extension complete with perimeter ceiling and finished externally with Cornice aluminium gutter shroud. Allow natural light to flood into your room with one of our UltraSky upvc or aluminium roof lanterns available in white, black or anthracite grey. Add an upvc or aluminium bifold door to your conservatory and bring the outside inside. Bifolding doors can also be used between the main house and the conservatory for added security and insulation. 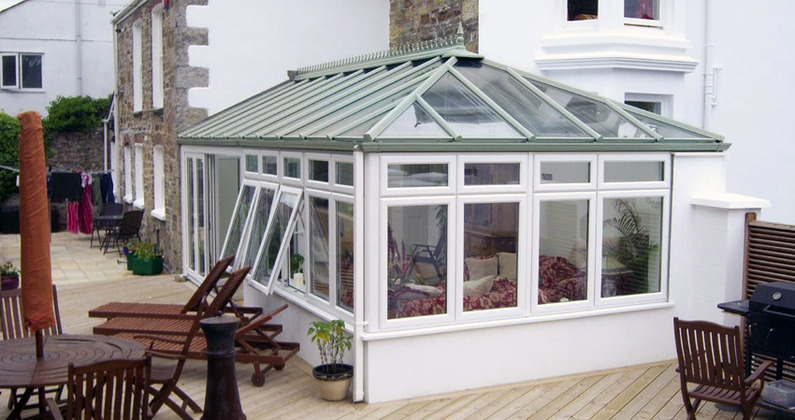 The Edwardian or Georgian is probably the most popular traditional conservatory design offering a central ridge and sloping front to the roof whilst the square footprint of the structure provides maximum floor area. Traditional conservatories remain the most cost-effective route to adding new living space to your home and our high specification will help you select a new room that can be used all year round. The Livin Room offers the best of both worlds, combining the natural light and sky of a conservatory with the walls and ceiling of an extension to create a pleasant, relaxing space that has the feel of a permanent home extension at a fraction of the price. Add the WOW factor to any traditional or contemporary conservatory by including a bifold door in your design. Offering unobstructed wide openings greater than a french door a folding sliding door allow you to seamlessley merge your new living space with your garden. Using a structually reinforced eaves beam bifold doors up to 4 panels can be accomodated without the need for steel portal frames. If you own a tired-out unloved conservatory that was installed many years ago and is now rarely used because it's either too hot or too cold why not consider replacing it with a 21st century model. You won't need planning permission or a builder as the replacement conservatory can be manufactured to fit onto the exisiting base and brickwork. Not only will you add another room you will also add value to your property by replacing an unuseable structure no longer fit for purpose! Whilst a traditional Edwardian or Lean to conservatory remains a popular choice for many, some customers are also looking for different styling options and higher specifications to make their new living space a permanent extension to their home that can be used all year round. A conservatory adds a new room to your home and styling options such as the Livin Room upgrade below add perimeter ceilings and brick piers creating an orangery style structure rather than a traditional conservatory design. 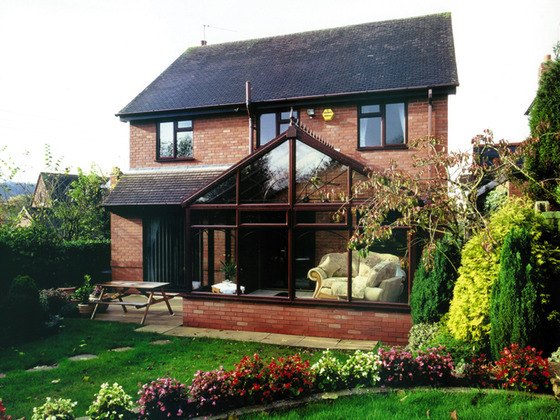 DIY conservatories have become a very popular route for adding permanent living space to a home. Most of the time it’s not necessary to have planning permission to add a conservatory and with its economical benefits; it’s a fast and easy way to add more space to your home at a fraction of the price of a brick built structure. Self build conservatory prices can vary enormously depending on where you look and the specification you choose but here at TC2U, we offer not only a wide range of stylish DIY conservatories, but also detailed information on what conservatories cost, how best to enhance them and ways to get the most from your new living space. In addition to Light Oak and Rosewood woodgrain finishes we can now provide many coloured woodgrain foil options including polar white, cream, Irish Oak and Chartwell light green. Coloured external finishes are becoming a popular upgrade choice as discerning homeowners look to differentiate their conservatories from their neighbours and create a truly individual addition to their living space. Our extended range of colours are supplied as standard with a white internal finish to ensure they always complement your internal decor. A DIY conservatory is the fast and easy way to extend your permanent living space and you may not even require planning permission. Our popular steel base system also offers the opportunity to add your additional living space without the need for a builder or large scale excavation. As a leading UK supplier of high specification DIY conservatories to the self build market we are specialists in providing an affordable Do It Yourself conservatory solution that will add value to your home and increase your living space all year round. We can provide a complete range of steel bases for DIY conservatories that make your installation easier, faster with less mess and best of all you don't need a builder to fit it! 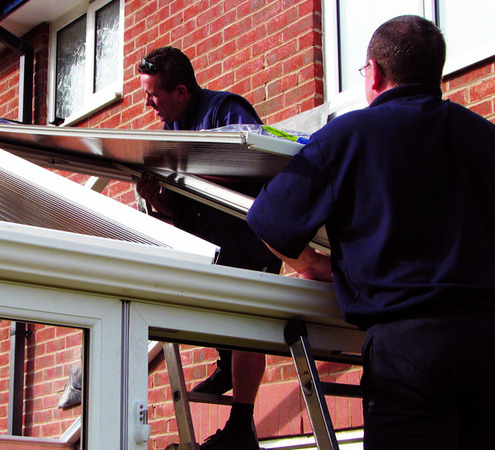 Choose a steel base and your conservatory installation can be completed in days not weeks. The base is covered by a 15 year manufacturer's warranty and BBA certification. For detailed information including an installation video see our Alternative Base section. All our made to measure self build conservatories are manufactured to order and are supplied with full installation instructions. If you are comfortable with Do-it-yourself projects our product will provide a cost effective, high quality addition for your home. Installing a conservatory yourself is by far the most cost effective route. For competent DIY enthusiasts, this option would be the most suited. An alternative option is to buy the conservatory from us and then rather than doing it yourself, get a builder in to install the conservatory and construct the base. Alternatively, it is also possible to use our Homefix service, which involves having your new conservatory installed onto a base by an experienced installer. While the Do It Yourself route is the most cost effective, any of these options will result in you saving a considerable amount of money. This can be as much as 60%, when compared to normal retail installed prices which means the addition of a DIY conservatory can be reflected in the value of your home a lot quicker. If you are looking for a cheap diy conservatory supplier because you are on a tight budget we will do our best to tailor the specification to meet your needs. Our self build conservatories have a class leading product specification as standard. As a leading UK supplier to the self build market you can be assured that all components are of the highest quality with most of our competitors options already included as standard. We specialise in supplying the DIY customer which means that our focus is on providing easy to install DIY conservatories that offer real value for money. Our prices include delivery to most mainland UK destinations but there may be additional delivery charges for the Scottish Highlands so please check with us before ordering. Our dedicated delivery fleet will deliver your new self build conservatory to your door in one consignment. We will provide a scheduled delivery day in advance so that you can arrange for adequate labour to be available for offloading. We will also provide you with detailed instructions on how to check your delivery on receipt and how to safely store and handle all of the components.